So Golden Boy Promoter Oscar De La Hoya Tweeted Monday evening, announcing a summer fight between a former great and an exciting veteran making a second go of his career. Matthysse (39-4) was a rising star until he was bested by Danny Garcia and, some time later, Viktor Postol at junior welterweight. After taking over a year and a half off, the Argentine slugger came back against Emmanuel Taylor in 2017, then won the WBA welterweight strap from Tewa Karam earlier this year. Pacquiao (59-7-2) clearly needs no introduction to even casual sports fans. One of the greatest boxers of his era, the 39 year old Filipino has recently slowed down his output as politics in his homeland have taken over much of the man’s time. Yet the fighter known as PacMan still wants to ply his trade and, after a highly controversial loss to Jeff Horn last summer, the multi-titlist is now going to battle for another major belt. 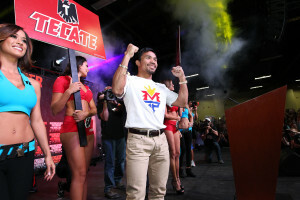 “Manny will make the final decision on this. He’s contemplating letting Buboy shine at the finish of his career.” It’s clear team Pacquiao may now be setting its sights on the future. “If Buboy can get a stable of boxers out of this,” Koncz said, “no hard feelings to Freddie, but Manny has not made a final decision.” Koncz also indicated that, should Pacquiao defeat the rugged Matthysse, he might next be setting his gaze upon wunderkind Vasyl Lomachenko. It may be unwise to look too far into the future, though, considering the fact that Pacquiao won’t have fought in a year by the time he steps into the ring to face Matthysse.